Nicola from the Mobile Tile Company is currently offering a free 1 hour consultancy session to make your home improvement dreams a reality. Wow. Q: Does bullying happen to adults? Being bullied isn’t only an issue for children and young people. Bullying is also very prevalent within the home and the work place. Bullying and harassment can take place for men as well as women of all ages. 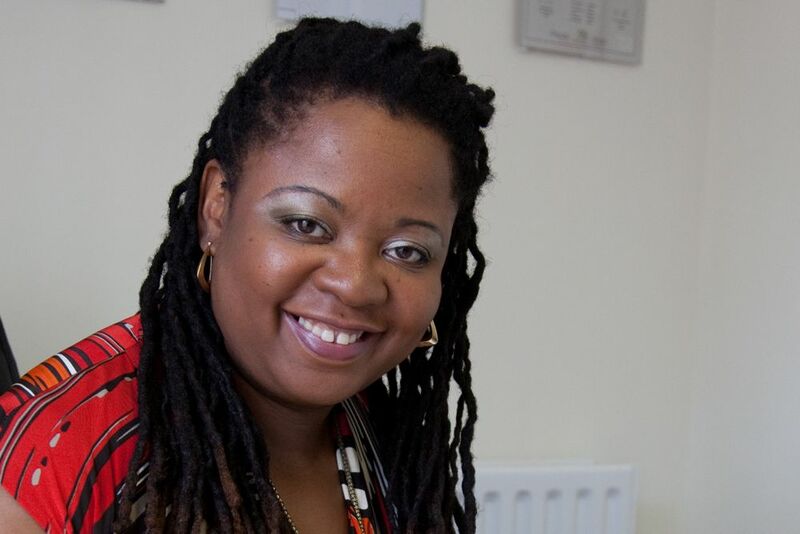 Is being bullied something that only children and young people incur? Q: Why do people sometimes feel bullied within the work place? For a multitude of reasons, people feel the need, desire or will to abuse their power over their subordinates or colleagues. Q: Can managers be bullied by their employees? Of course, situations do arise where subordinates, or colleagues within the work place bully and harass their managers too. Q: Can men be bullied within their homes? Yes, domestic abuse can take place between male and female partners where the female partner inflicts physical and or mental abuse upon their male partners. This can become very embarrassing for men and an issue that they find exceptionally difficult and embarrassing to seek help to deal with. Which can often lead men to unnecessarily suffer for continuous periods without seeking any help or support to deal with domestic abuse. This is actually a very difficult issue as some organisations penalise the victim for reporting being bullied. Some members of the workforce may also be inclined to further seek to victimise the bully and side with the perpetrator. It is important to note that fair play does not always take place. There may be many options that you may wish to consider and one option may be to seek a planned exit from the situation that you are facing as you may ultimately win the battle but not the war that you are dealing with. It is important to be very much aware that fighting bullies can be painful and time consuming. It may also have a detrimental effect upon your health, family and emotional wellbeing. Although many organisations have excellent policies and procedures in place, this does not necessarily mean that they will effectively and efficiently invoke their grievance, bullying or harassment procedures. All this said, careful thinking and strategies need to be invoked by the victim, making sure that they have strong and effective support mechanisms in place to support them through their decision making processes as the decision to fight or flight should be yours and supported by your key others too. Consider invoking the services of life coach to support you through the change and action process. 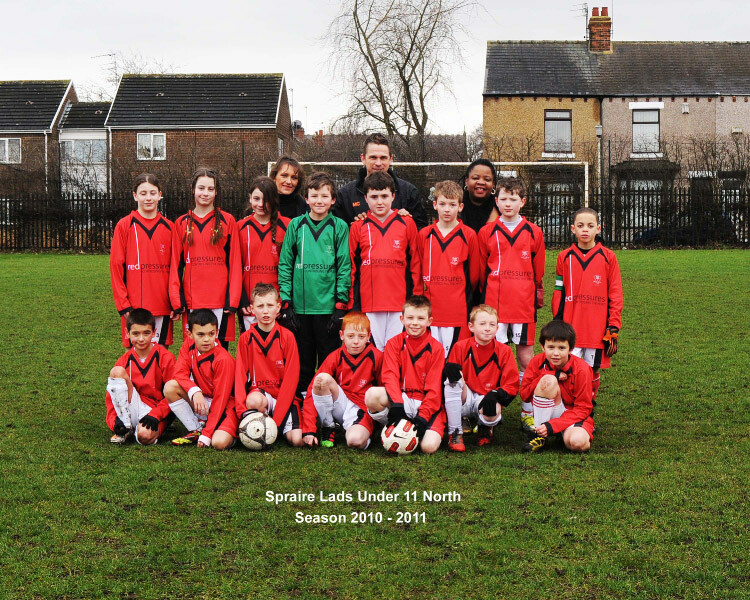 We have previously shared that we are sponsoring Spraire Lads and Lasses U11’s North team. We commissioned Eddy Ellwood of Unit 22, Parkview Industrial Estate, Prospect Way, Hartlepool to make our strips which were designed in partnership with Red Pressures and LocalRus. 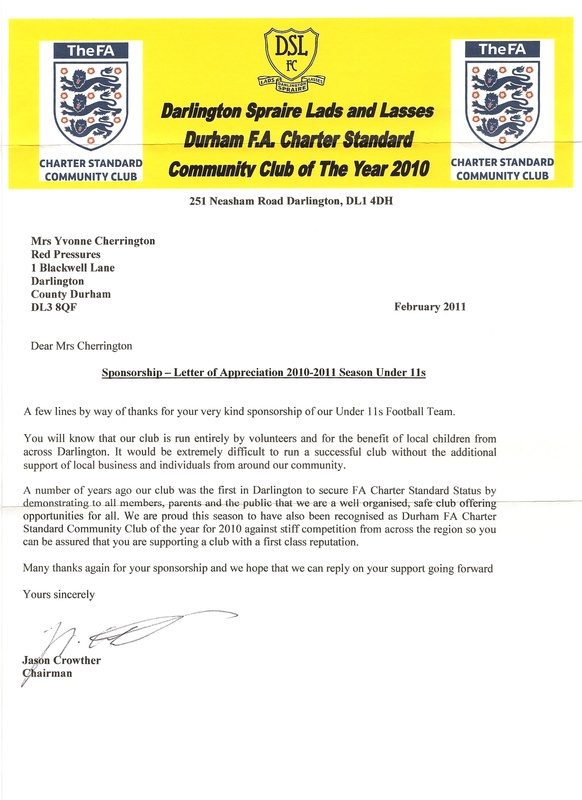 Today, we received acknowledgement from the club’s Chairman which was very nice. Please contact Chairman Spraire Lads and Lasses – Jason Crowther on 07919 568 537 for further details of how to sponsor a Darlington Spraire Lads Team. Draft picture by Filmar Photography. Givers Gain - How rewarding it is to sponsor a local team.